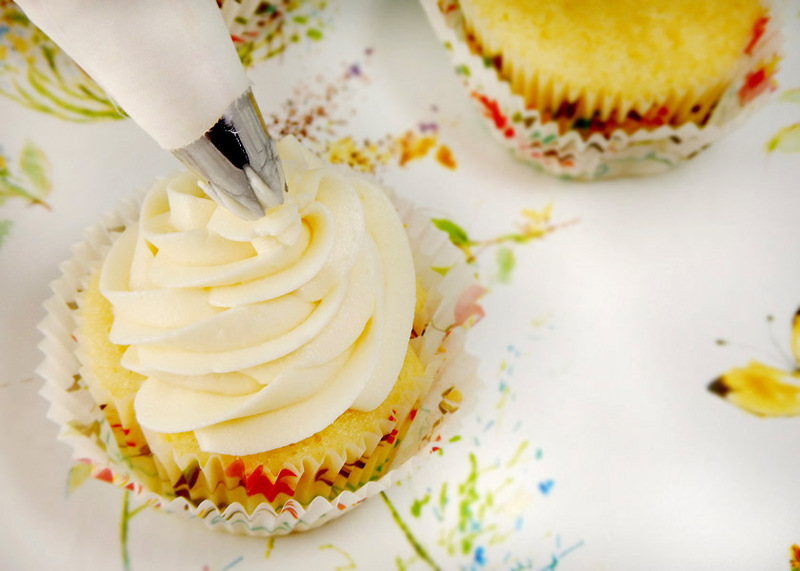 Once you make your own buttercream, you will never want to go back to the preservative-filled canned frosting. This is the best basic buttercream frosting. It takes just five minutes and five ingredients to whip together. Bonus; They’re all real ingredients that you can actually pronounce, no polysorbate or partially hydrogenated vegetable oil here. Update: I have a special gift for all of you who have requested more flavors. 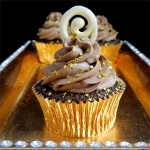 My Chocolate Buttercream Frosting recipe is now posted! Start with unsalted butter and vanilla. I know some of you are wondering why I use unsalted butter then add salt to the recipe. When we add our own salt, we know exactly how much we are using. The amount of salt in butter varies. Your butter should be soft and spreadable but not melted. It’s best if let it soften naturally at room temperature for at least half an hour before you plan to make the frosting. You can cut it into small pieces to speed up the process. If you’re in a hurry, you can do this in the microwave but you have to be very careful. I’ve accidentally melted more butter than I care to admit. Set the microwave to defrost (30% power) and microwave for ten seconds. Press your finger into the butter. If your finger leaves an indentation, your butter is soft. If the butter is still hard, microwave at 30% power for another ten seconds. Continuing checking at ten second intervals until the butter is soft. 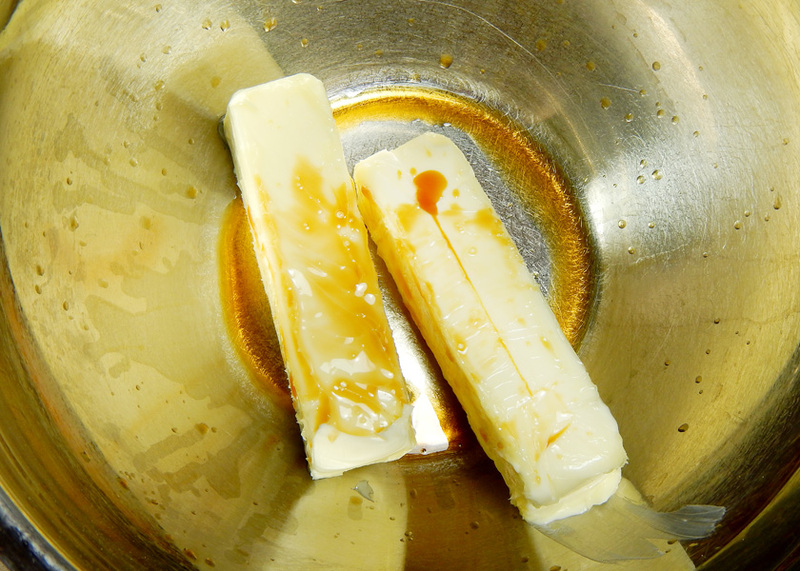 Beat the softened butter and vanilla until the mixture is smooth and shiny. Gradually add powdered sugar. Do this on low speed so you don’t end up with a sugar-shower. I’ve been there and it’s not pretty. Beat in heavy cream one tablespoon at a time. You could use milk or some other liquid but nothing else will give you the luxurious feel that only real cream provides. Beat the frosting until it’s light and fluffy. This is where I have to turn my willpower dial up to high. 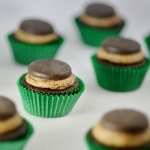 I need to get this on cupcakes before I “taste-test” too much and have to make another batch. This pipes beautifully. I like to use a Wilton 1M tip for big swirls. This topping pairs well with vanilla cake, chocolate cake, lemon cake, strawberry cake, pretty much any cake flavor you can dream up. I’d love to hear what you use it on in the comment section. 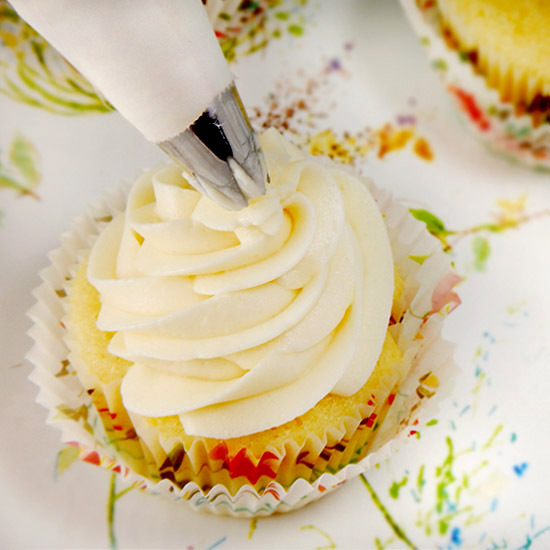 This basic buttercream recipe is an excellent flavor canvas for you to experiment with. You can add different flavorings, almond extract is one of my favorites. You can also try mixing in candy or even sprinkles to make your own Funfetti Frosting. Want more fun recipes and kitchen fun ideas? You can follow me on Facebook, Twitter, or Pinterest. You can also sign up for a free email recipe subscription. 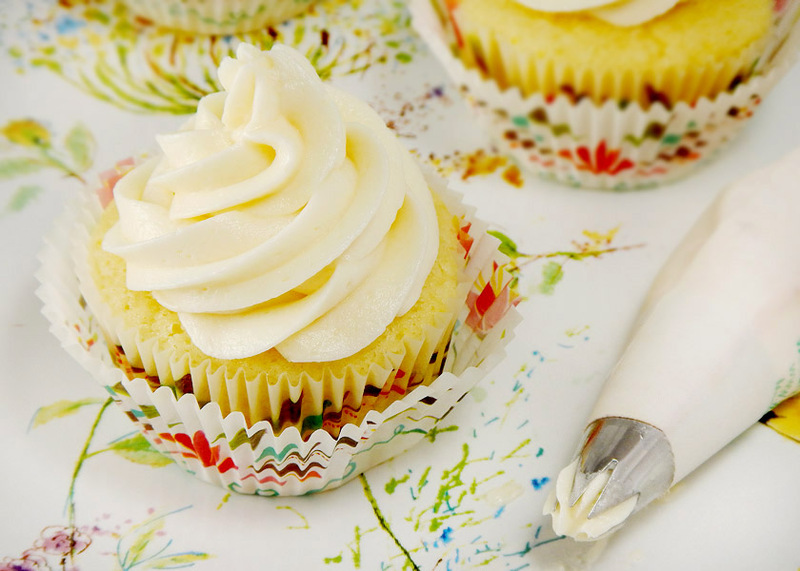 A simple creamy homemade vanilla frosting. In large bowl, beat butter and vanilla until smooth. Gradually beat in powdered sugar and salt. Mix in heavy cream one tablespoon at a time. Beat until light and fluffy. This recipe will generously frost 12 cupcakes or an 8-inch layer cake. If you need thicker frosting for piping decorations, add half a cup of powdered sugar. 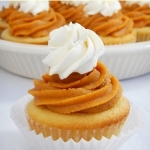 If you prefer thinner frosting, add more heavy cream, 1 tablespoon at a time, until you reach the desired consistency. 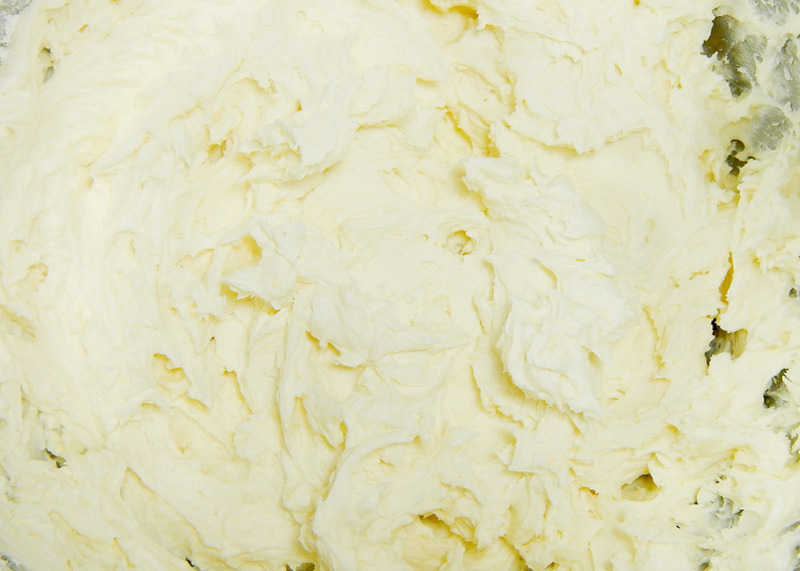 Nothing better than a good buttercream recipe. Looks delicious! Can I use all shortening for a pure white frosting? I’m sure the butter would taste better though! I haven’t tried replacing the butter with shortening in this recipe. Generally speaking though, you can replace butter with shortening to get a brighter white. The butter definitely tastes better. 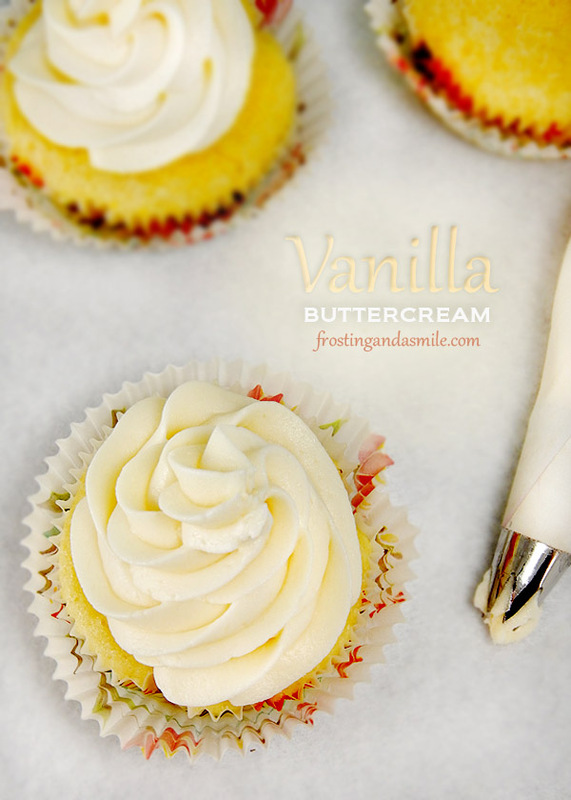 The large amount of vanilla in this recipe might make it tough to achieve pure white. I use the clear vanillia it helps. 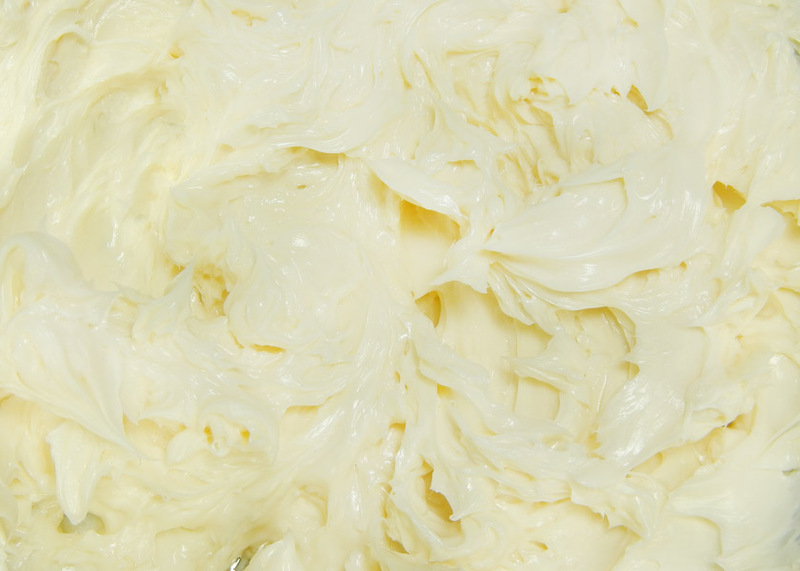 I make pure white frosting using shortening, clear butter & clear vanilla flavoring. I’m planning to try this buttercream and it will be the first time making buttercream and I just want to know how much is two sticks of butter? That’s 1 cup of butter. It weighs half a pound. Good luck with your first buttercream! Hi will this maintaiin it fluffy consistency over night . I want to make this for a bday and put into cupcakes so I’m wondering if it’ll fall flat if left over night or if it’ll maintain the fluffy texture ? This will hold up well overnight. Enjoy the Birthday! Every time I try to make frosting, it separates – even when I follow the recipe. What am I doing wrong? It’s hard to say without being in the kitchen with you. When in the process is it separating? If it’s a meringue buttercream, just keep beating and it will come together. You can email me more details at laurie@frostingandasmile.com and I’ll try to help you figure it out. I made this tonight and it was heavenly! I scraped out a vanilla bean and added a bit of cinnamon and it tastes just like ice cream! I’m having the hardest time not eating it all before I frost this cake! I’m happy to hear that, Amanda! Vanilla bean is an excellent addition. I’ve never done the cinnamon before. I’ll have to try that. Thanks! Seriosuly the lightest and most delicious frosting EVER. I will never never never use frosting from a can. Ever. Thank you for sharing!! I’m so happy to hear you like it! You certainly won’t miss the cans. Hello Shannon, You could use skim milk. You are right that it won’t be as rich as the original recipe but it will work. 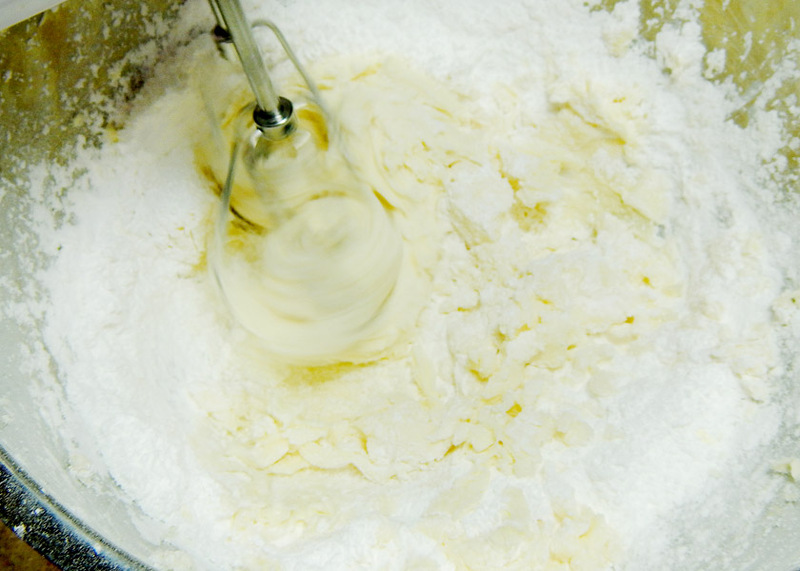 Try mixing in just one tablespoon at a time to make sure it doesn’t get too watery. In a pinch you could also use coffee creamer or a nut milk (such as almond or cashew). Sounds like you are having a fun snow day. Stay safe! I made this tonight and it was good and easy! 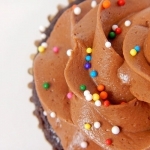 But is it better to refrigerate before pipping it on to cupcakes? Hi Ashley! I’m happy to hear you liked it. You don’t need to refrigerate it before you pipe. If you aren’t going to be using it for a while, you can put it in the fridge. Just bring it back to room temperature and briefly rewhip before piping. How would you go about adding coloring to this recipe, so it doesn’t get too runny? Hi Courtney! 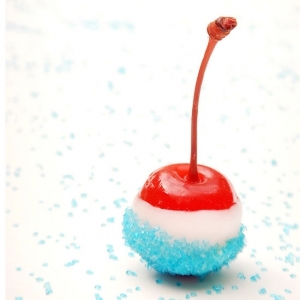 You can usually add a bit of food coloring without any problems. I prefer to use gel food colorings because they are thicker. If you need a lot of color and only have liquid color just replace some of the cream with it. For example if you need a teaspoon of liquid food coloring, just omit a teaspoon of milk from the recipe. I’d love to see what you’re making! What is HWavy cream ? I’m in the uk ? Gemma, I’m so excited to have a reader in the UK! Heavy cream is a great whipping cream that has at least 36% milkfat. You can substitute double cream across the pond. It’s thicker than heavy cream so add a little bit at a time and taste as you go. Good luck! Please let me know how it works out for you. I’m looking forward to trying this. One question though. I noticed that this recipe will frost an 8 inch cake. What would the modifications be if frosting a 9 inch cake? Thanks! This should be fine for a nine-inch cake as well. Happy Baking! I loved this recipe!! Does it need to be refrigerated? Thank you, Emily. I find that it’s ok out for several hours. Any longer, and I’d recommend you refrigerate it just to be extra careful with food safety. Always serve buttercream at room temperature though. I just made my first homemade icing ever today using your recipes for the vanilla buttercream and the chocolate/peanut butter buttercream. They look good and passed the family’s tasty test. First time piping too. The vanilla seemed a bit thin for piping so I thought I did something wrong…then I read your recipe again and saw the recommendation for an added 1/2 cup sugar. I’m wondering about the fine grainy sugar texture… is that supposed to be when using powdered sugar? I was expecting a creamy thick smooth texture. I’m happy to hear the family approved and congratulations on braving your first piping! 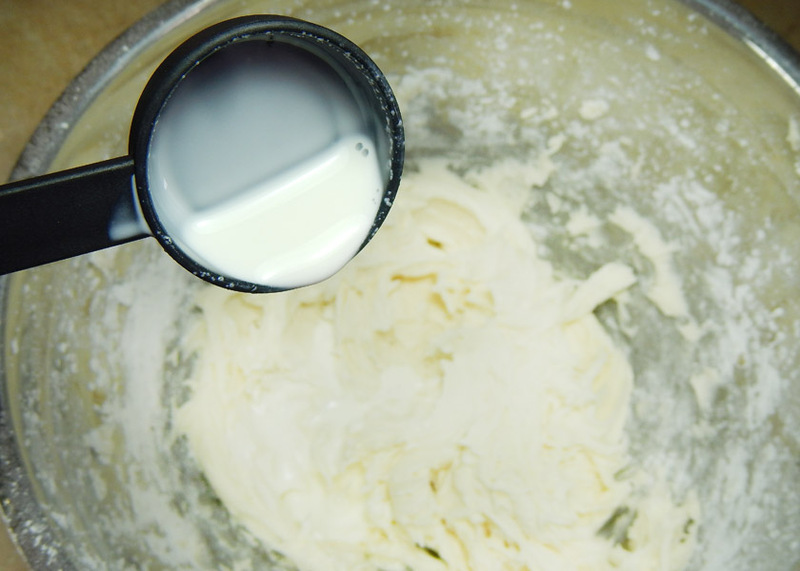 American style buttercreams (which both frostings you mention are) can have a grainy texture, especially if you don’t thoroughly beat your butter and sugar together. Hi I was wondering if you could give me a general time for how long i should beat the butter to make it light and fluffy. I always seem to end up with bits of butter in my frostings. Also my family doesnt like their icings to be very sweet, so i was wondering if putting in only about 1 cup of powder sugar would affect the texture, and what i could do to keep the texture the same while not putting in all the sugar. Thank you for reading this. It should only take about a few minutes to get it light and fluffy. The longer you whip it, the fluffier it will become. If you are getting bits in your frosting, the butter may not be warm enough when you are beating. Make sure it is at room temperature. Yes, I agree about the butter. It needs to be at room temperature. I have added a bit more salt to frosting to cut some of the sweetness. I discovered that when I put too much salt one time and actually liked it! Did you use vanilla extract what kind of vanilla is it? I used real vanilla extract. You can use any brand you like. Is powdered sugar the same as confectioners sugar or icing sugar? Another shortcut that I use to soften butter (especially if, like me, you like to store extra butter in the freezer) is to grate it using the large holes on a box grater. If wanting to use another flavoring, such as almond, do you use it in place of the vanilla or along side it? You could use another flavoring in place of or along side the vanilla. It depends on your tastes.